Local MSP Stewart Stevenson has received details from Transport Scotland of planned maintenance and repair works to the A90 following concerns about the condition of the road surface in certain locations. “These works will be welcomed by motorists and I look forward to them taking place during the coming financial year. Anyone spotting a specific road defect on the A90 Trunk Road can of course log this by calling 0800 028 1414. Banffshire & Buchan Coast MSP Stewart Stevenson has backed calls from SNP MPs at Westminster for the UK Government to ensure the future of the Post Office network is secure. SNP MPs obtained an Adjournment Debate at Westminster this week on the matter, highlighting the rising importance of Post Offices to small towns and rural communities and renewed SNP calls for the UK Government to act to protect their future. The debate comes as UK Finance, trade association for the UK banking and financial services sector, re-negotiates the current deal with Post Office Ltd where financial remuneration for sub-postmasters from banks to carry out services falls short. “As bank branch numbers continue to fall, local Post Offices have become increasingly important to local communities - particularly the elderly and those with additional support needs because of the face-to-face banking services that they provide. This is on top of the role they play in services regarding post, advice, pensions, benefit administration, and community spaces. “Our local Post Offices play a huge role in public life – they are both a symbol of the community and a lifeline on everything from pensions and benefits to vital day-to-day banking services. “In many communities in the North-east, the local Post Office is the last place where a face-to-face service is available, making it essential for the elderly and those with additional support needs. 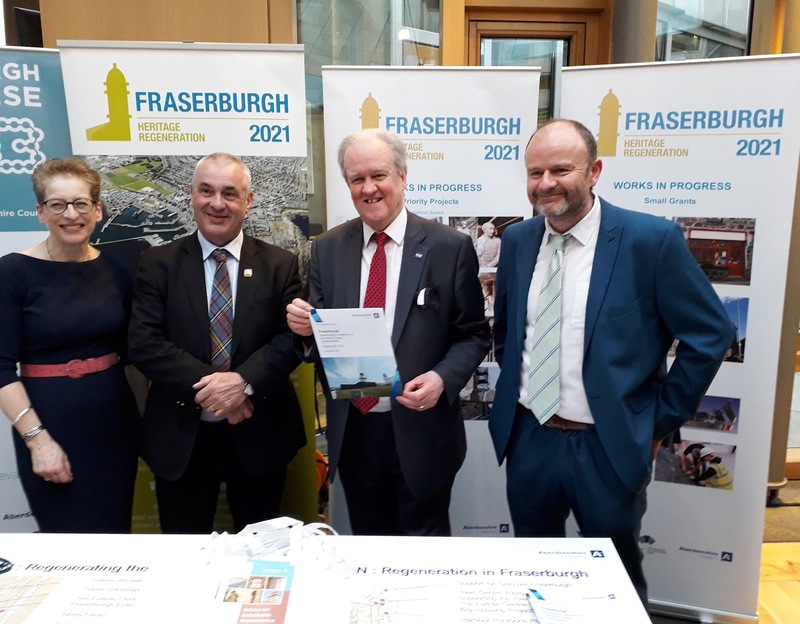 Scotland’s Towns Partnership (STP) held an event in Parliament this week to showcase local regeneration projects and Fraserburgh was among the towns represented. Banffshire & Buchan Coast MSP Stewart Stevenson was pleased to meet with officials from Fraserburgh 2021 to be briefed on progress. “It was a pleasure to meet with representatives from Fraserburgh 2021 and hear an update on their plans. “The event as a whole was a useful opportunity for regeneration towns across the country to be represented and come together to share best practice and compare what works. 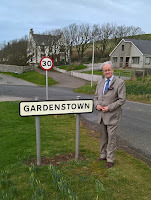 The legislation was discussed at today’s meeting of the Parliament’s Rural Economy and Connectivity Committee, of which Mr Stevenson is a member. “While we still do not even have a date for the UK to leave the EU, far less any clue as to what form that will take thanks to the abysmal shambles the Westminster Tory Government is making of it, thanks to the civil war within the Tory Party, the Scottish Government is preparing for all scenarios. New independent analysis from the Scottish Parliament’s Information Centre (SPICe) has confirmed Scotland is leading the rest of the UK in the fight to reduce harmful carbon emissions. Scotland's total emissions reduced by 35% between 2008 and 2016 - outstripping a 27% reduction across the UK for the same period. Meanwhile, England achieved a 29% reduction between 2008 and 2016. Decarbonisation of Scotland's electricity sector, and reductions in emissions from waste, have helped Scotland outperform the UK overall as emissions continue to fall year on year. The closure of the Longannet power station in March 2016 has also had a substantial impact. Independent, expert advisers have described the targets in the Scottish Government’s Climate Change Bill, set to be debated by MSPs next month, as at the very limits of feasibility. The bill would mean that Scotland is carbon-neutral by 2050, and includes an ambition to achieve net-zero for all greenhouse gases as soon as possible. "These latest statistics are hugely encouraging and show that Scotland continues to lead the rest of the UK in reducing its carbon emissions. “Parliament will shortly debate the Scottish Government’s Climate Change Bill that sets some of the most ambitious climate change targets in the world. "But there is no room for complacency. We all have a role to play in meeting our carbon emissions targets whether that's as an individual, as a community or as a business. "The fight against climate change is one of the defining challenges of our time - the SNP is fully committed to maintaining Scotland's place as a global leader in emissions reduction, delivering ambitious, credible and affordable targets for the future." Banffshire & Buchan Coast MSP Stewart Stevenson has praised the work of Modo, the social circus group based in Peterhead which works with young people. The SNP MSP was attending the Modo Awards last night in Peterhead where he presented the Saltire Ascent and Approach Awards, and the Gold and Silver YAVAs (Young Aberdeenshire Volunteer Awards). The Saltire Awards, echoed by the YAVAs at a local level, are designed to formally recognise the commitment and contribution of youth volunteering. Supported by the Scottish Government, the Saltire Awards enable young volunteers to record the skills, experience and learning gained through successful volunteering placement. “It was a real pleasure to present these awards to so many talented young people. “While everyone can appreciate the spectacle of the public performance, in so many ways, the real value of Modo is the important work it does with young people in developing their confidence, helping them to work in co-operation with others and giving them a sense of pride in what they do and in their community. Banffshire and Buchan Coast MSP Stewart Stevenson has said Common Agricultural Payments (CAP) to eligible farmers, crofters and land managers can be expected in coming months. More than a third of a billion pounds in payments have begun, with around 78% of eligible claimants having already received up to 90% of their entitlement through a government loan in October last year. In total, over £300 million of European funding will be paid to more than 18,000 farmers, crofters and land managers, offset by the recovery of BPS2018 loans where customers chose to take one. “These payments are in line with the schedule published by Cabinet Secretary Fergus Ewing and will support investment, jobs and the rural economy. “It will help to provide certainty for many in rural communities including in my constituency. “Brexit continues to present the biggest threat to the farming industry. Common Agricultural Policy payments are guaranteed at current levels until 2021, which offers a degree of certainty and stability during these uncertain times. Businesses will be able to access support from the Scottish Government as they prepare for Brexit with funding of up to £4,000 each. The move has been welcomed by Banffshire and Buchan Coast MSP Stewart Stevenson who has urged small and medium sized businesses to apply for the Brexit Support Grant. It will be administered by Scottish Enterprise and will help to manage a range of Brexit impacts. The grant had previously been open to exporters but will now be available to SME’s in Scotland for a wider variety of Brexit preparation. It can be accessed by businesses employing up to 250 staff and can be used for activities including consultancy support, professional fees, external training, and international market research. “I would urge businesses in my constituency of Banffshire and Buchan Coast to apply for funding if they are eligible. “Brexit creates a huge array of challenges for small and medium sized businesses and we must do everything we can to help mitigate against the damage to the Scottish economy. “It is critical that Scottish businesses continue to assess the challenges presented by Brexit and take necessary action to safeguard their growth. “Preparing your business for Brexit is about developing a flexible planning approach so you can adapt and be resilient across a range of potential Brexit outcomes. A North-East MP has been slammed for failing to ask a question at when given the opportunity at Prime Minister’s Questions by Theresa May. Following an historic vote on Brexit in the House of Commons 24 hours earlier, in which the UK Government was once again defeated, Banff and Buchan MP David Duguid was unable to think of any questions to ask on behalf of his constituents. Tory David Duguid has been the MP for the Banff and Buchan Constituency since he was elected in 2017. During Prime Minister’s Questions, Speaker of the House John Bercow calls upon Mr Duguid to ask a question but is rebuffed by the MP. Mr Bercow goes on to point out to the Tory MP he had previously indicated a desire to speak. It comes as sectors across the North-East risk losing an influx of migrants who come to live and work in the area. A number of sectors including hospitality, tourism, fishing and social care could be left with a skills gap. Now Banffshire and Buchan Coast MSP Stewart Stevenson has put forward questions the MP could have asked on behalf of his constituency. “Mr Duguid represents one of the constituencies most at risk of a hard Brexit or No Deal and yet he has failed to stand in the House of Commons and ask a question of the Prime Minister. “To say this is a failure of his duty would be an understatement. The Scottish Tory MPs have been inadequate in their representation of Scotland. “From concerns about the state of the economy and how the salary threshold of £30,000 will impact the number of migrants to the North-East, funding provisions for digital connectivity and the impact huge tariffs could have to sheep farmers for imports to the EU, there are an abundance of issues facing Mr Duguid’s constituents. The UK Government has been called on to abandon its current post-Brexit migration proposals which would set a salary threshold which could harm the number of labour migrants coming to work in Scotland. Banffshire and Buchan Coast MSP Stewart Stevenson has called on the Scottish Parliament urging it to seek assurances the move would be axed. In a motion to parliament, Mr Stevenson has warned the move will have a “disproportionate negative impact” on the Scottish economy by creating a huge decline in the working age population. There are also fears it would cause staff shortages in key areas including textiles, hospitality, sales, seasonal agriculture and vital social care services. It comes after a recent report from the Expert Advisory Group on Migration and Population found that less than 40% of workers in the Aberdeenshire Council area and less than 30% of workers in the Moray Council area earn above the £30,000 threshold. “The isolationist migration policy proposed by the Tories is totally out of step with Scotland’s needs - freedom of movement has enriched both our workforce and communities here in the North-East. “Setting a £30,000 threshold will drive people away from Scotland, damaging our local economy and hammering vital public services - our social care sector in Aberdeenshire simply wouldn’t function without migrant labour. “The North-East relies on steady migration from both the EU and elsewhere to support industries including fish processors, tourism and hospitality. 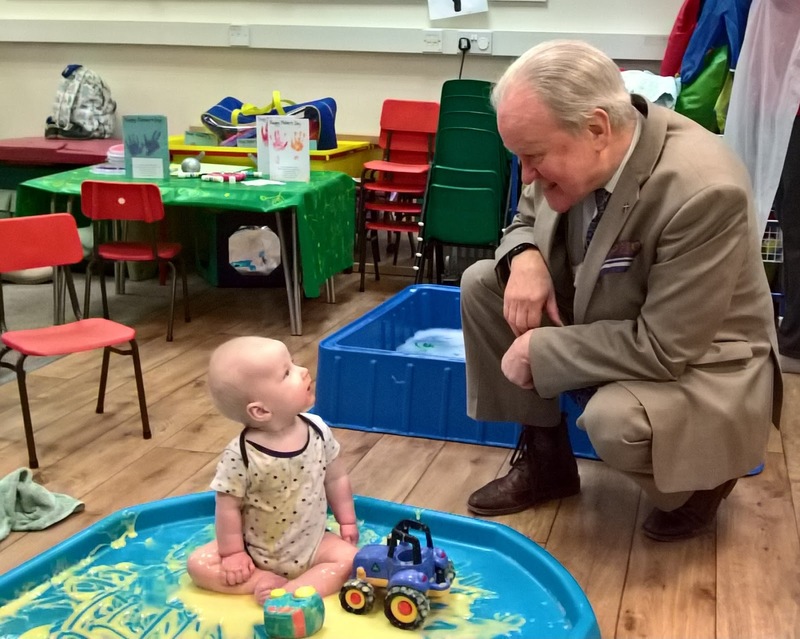 Banffshire & Buchan Coast MSP Stewart Stevenson enjoyed a recent visit to Home Start Deveron in Carmelite Street, Banff. The MSP met with the recently-appointed Senior Co-ordinator, Martin Robertson, and called in on the staff, volunteers, mums and babies of the ‘Baby Buddies’ group which meets at the Home Start centre every Friday. Home Start Deveron has been supporting families across the Deveron Valley area since 1999 and formed a consortium with other schemes across the Aberdeenshire area back in 2015. 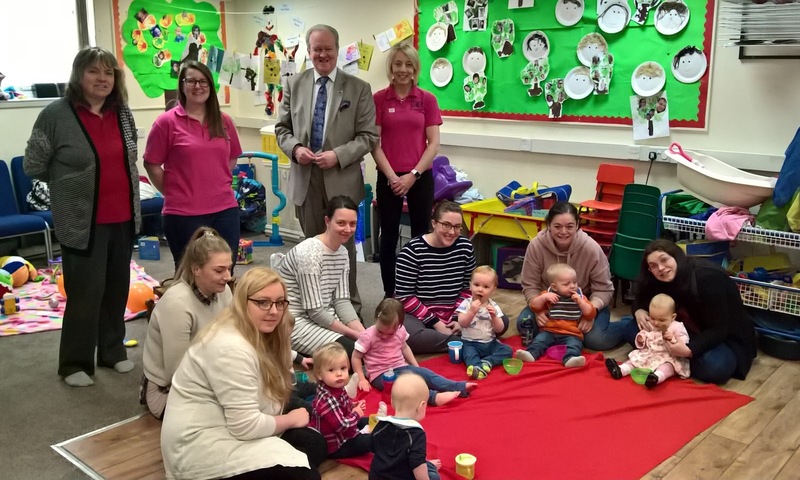 The Deveron group covers the Banff and Macduff, Turriff and Huntly areas, offering advice and support to families with younger children, and is affiliated with Home-Start UK/Scotland, a leading family support charity. In 2016/17 Home-Start Deveron supported 366 families through a combination of 1:1 home-visiting support, group sessions & social events. Support is tailored to each family and their individual needs, and Home Start works with the whole family. The organisation also recruits and trains volunteers to visit families within their own home for 2-3 hours per week to offer informal, friendly, non-judgemental and confidential support. In addition to the Senior Co-ordinator, there are two Family Support Workers who support families on a 1-1 basis as well as running groups alongside volunteers. Families are mainly referred to Home Start via a range of agencies through the Aberdeenshire Health & Social Care Partnership, or by self-referrals direct through the office. Home-Start Deveron helps families facing many different challenges, these include but are not limited to rural/social isolation, post-natal depression, families affected by disability, chronic or terminal illness, or affected by substance misuse or domestic abuse. “I was extremely impressed by my visit to Home Start and very much enjoyed meeting with the mothers and children of the ‘Baby Buddies’ group. It was great to see the youngsters interacting with each other, while the young mums were able to enjoy the companionship of others as they joined the children at play. Local MSP Stewart Stevenson has presented a £250 boost to the fundraising efforts of a local voluntary group courtesy of research interviews he took part in recently. Research firms Ipsos MORI and PA Advocacy asked the MSP to take part in an interview and offered a donation to charity if he agreed to take part. Mr Stevenson did so and nominated the Three Kings Cullen Association as the worthy recipient. 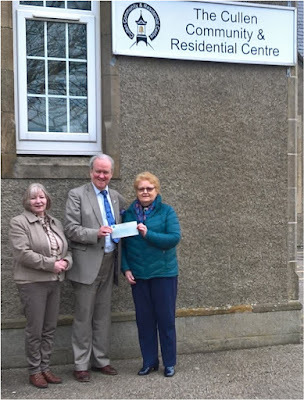 Mr Stevenson presented the cheque to Association Chairperson Brenda Gifford during a visit to Cullen Community and Residential Centre where he heard about their fundraising efforts and was updated on their project. 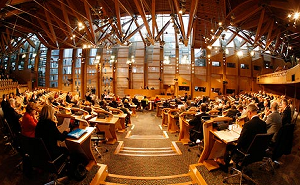 “I get approached to take part in these surveys and research interviews from time to time in my role as an MSP. Most of them usually offer a fee for taking part and I donate these to good causes around the constituency. 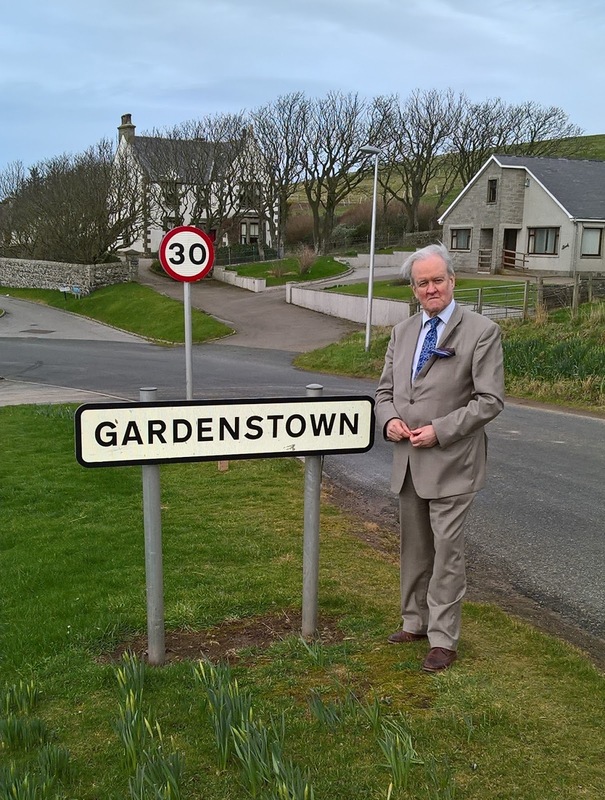 Following on representations from local residents, Banffshire & Buchan Coast MSP Stewart Stevenson has called on Aberdeenshire Council to review its decision to cut the 273 Saturday bus service to Gardenstown. “This is a community which has already faced months and months of disruption as a consequence of a landslip and the extensive assessment and remedial work which resulted. “I have been approached on behalf of a number of local residents who have protested that the axing of this service will result in the isolation of vulnerable residents. It will also seriously inconvenience the many tourists and visitors who rent summer properties in the village, for which Saturdays are a common ‘changeover day’. “It has been reported to me that there had been problems with the reliability of the service even before the landslip, so it is no surprise that passenger numbers may have dropped. That notwithstanding, it remains an essential service for those who are forced to rely on it, and I am told that there had previously been an undertaking to provide a smaller and more reliable vehicle to service the route. A community project in the North-East has been awarded a six-figure cash boost after securing National Lottery Funding. Banffshire and Buchan Coast Stewart Stevenson MSP has hailed the investment for the Moray Reach Out project. The £123,253 funding from the Big Lottery Fund Scotland will support a move into new premises in central Buckie and to refurbishing the building. They project will also engage a Training and Support worker who will be responsible for helping people with poor mental health, learning disabilities and those experiencing isolation or loneliness. The Big Lottery Fund Scotland is focussed on distributing National Lottery Good Cause funding to help people and communities most in need throughout Scotland. “This six-figure sum will go towards helping the wonderful community-led project in moving to new premises as well as supporting a worker who can help those in the community who need it most. “National Lottery Funding grants such as this can be a lifeline for groups such as Moray Reach Out Project who deliver such important work in the North-East. 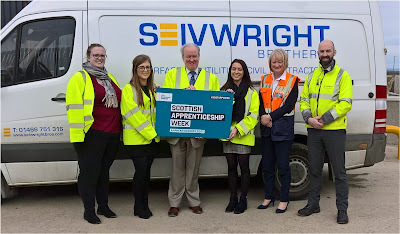 Banffshire & Buchan Coast MSP Stewart Stevenson paid a visit today (Friday) to local contractors Seivwright Brothers of Cornhill to mark Scottish Apprenticeship Week. Seivwrights currently have ten apprentices in construction and business administration. The SNP MSP was invited to meet local Modern Apprentices to hear from them about their work-based experiences, and to showcase the benefits of apprenticeships for young people, for employers, and for the Scottish economy as a whole. “Modern Apprenticeships are all about building skills for the future. There now are over 27,000 new apprenticeships started every year in Scotland, providing excellent opportunities for young people and employers alike, and building the skilled workforce that Scotland will need in years to come. “It's great to see local young people and local businesses participating in the scheme. The extra support that the Scottish Government has provided for apprenticeships in rural areas is helping to ensure that all parts of the country can benefit from apprenticeships. Good links between schools, colleges and employers mean that opportunities are available to more young people than ever before. Banffshire & Buchan Coast MSP Stewart Stevenson and Turriff & District SNP councillor Alastair Forsyth have welcomed the £330 million investment in North-east railway infrastructure by the Scottish Government. The SNP MSP was speaking after attending a briefing with Network Rail and ScotRail officials in Aberdeen outlining the work schedule for the upgrade of the Aberdeen to Inverness line. “Following on from the long-awaited completion of the Aberdeen Western Peripheral Route and the Balmedie-Tipperty dualling, this project represents another huge and welcome investment in the North-east’s transport network by the Scottish Government. “The details of the project outlined by Network Rail and ScotRail officials at the briefing I attended are impressive and will deliver enhanced rail services to and from this important transport corridor once complete. 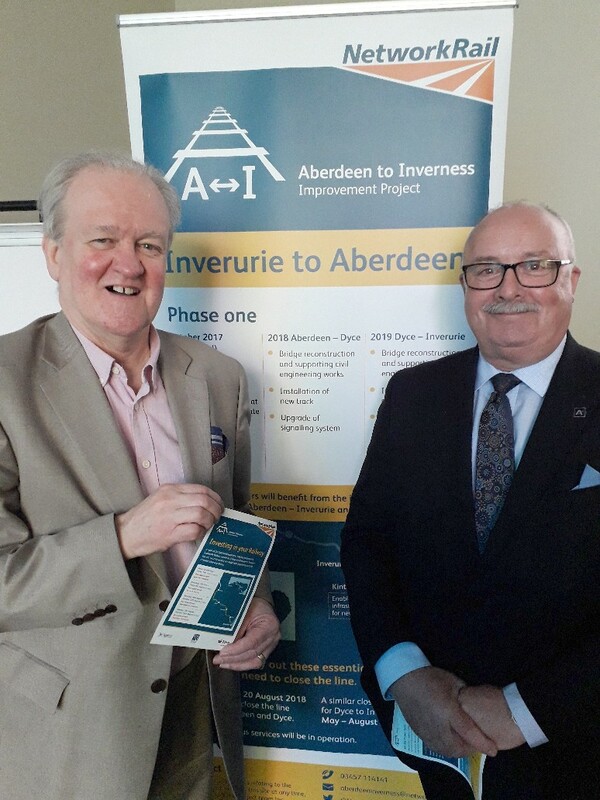 “People using our local stations at Inverurie and Huntly will benefit greatly from more frequent services which, once completed, this work will allow. Banffshire and Buchan Coast MSP Stewart Stevenson has welcomed a five-figure sum of funding for community groups. It comes after the funding was given for the National Lottery Awards for All Scotland grant from The National Lottery Community Fund. The Anna Ritchie Parent Council received £10,000 which the group will purchase a 16-seater wheelchair accessible minibus to transport pupils to sporting and community engagements. A cash boost of £3,500 was received by the Cetacean Research & Research Unit (CRRU) which will be used by the group to purchase a laptop, a projector, banners and educational tools to deliver marine stewardship workshops to schools and youth groups in coastal communities in Moray and Aberdeenshire. The National Lottery Awards For All Scotland gives groups a chance to apply for a National Lottery grant of between £300 and £10,000 for projects that aim to help improve local communities and the lives of people most in need. “The funding received by these groups will be of great benefit to them and the work they do. “I know the £10,000 awarded to the Anna Ritchie Parent Council will make transport much easier for getting pupils to sporting and community events. “As an MSP for a coastal constituency, I am delighted the CRRU will be able to purchase items which will help them to visit local schools and youth groups and educate them on marine life. Aberdeenshire Council has been urged to make the most of its funding allocation from the Scottish Government’s £50million Town Centre Fund. It comes after SNP Finance Secretary Derek Mackay announced plans for the fund, which aims to drive local economic growth by helping town centres fund projects such as re-purposing buildings for retail, business and community enterprise, while improving access and infrastructure. After allocations were announced this week by the Scottish Government, it has now been confirmed that Aberdeenshire Council will receive a share of £3.2million from the new ring-fenced fund. Now, the cash-boost has been welcomed by Aberdeenshire East MSP Gillian Martin, Banffshire and Buchan Coast MSP Stewart Stevenson and the local authority’s SNP group. “This funding announcement will help to transform town centres in Aberdeenshire, including towns like Ellon in my constituency. “The SNP’s Town Centre Fund is part of a wider package of business support measures that will help drive economic activity in Aberdeenshire, helping give our local high streets a welcome boost. “This announcement of funding is extremely welcome. Having spent some time last year visiting a range of new businesses, refreshed businesses and other community schemes I would very much wish to see this funding support innovative ideas which can support our town centres. "This is excellent news. I'm particularly pleased that Aberdeenshire has received such a high, above-population share of the £50m that was available Scotland-wide. "This investment from the Scottish Government will give us the opportunity to invest in improving our town centres right across Aberdeenshire to help deliver sustainable growth and jobs, making them even more attractive places to be." “Huntly town centre has been deteriorating for a number of years now, and this was a major factor in the establishment of the Huntly Town Team, which is a regeneration project for the town. “It’s by far not the only town centre which is struggling at the minute, and I’m delighted to see dedicated funding from the Scottish Government to address these issues.